Some background: my grandmother was, by all accounts, a complicated woman. 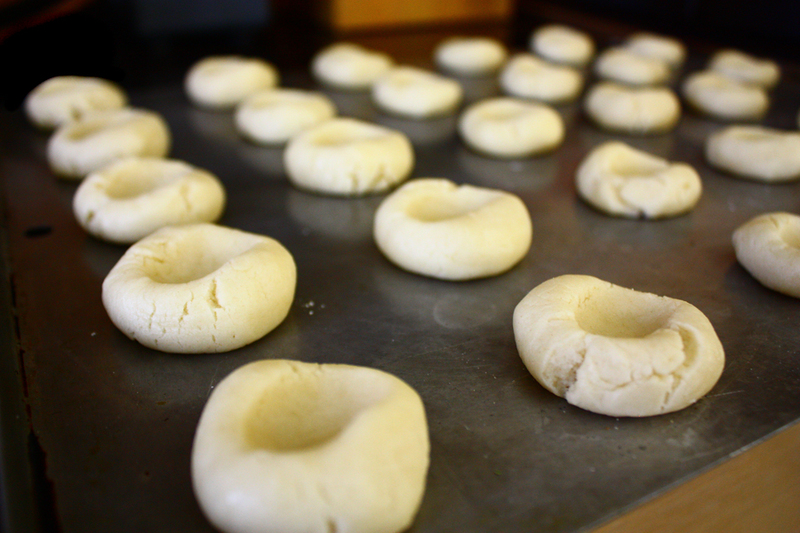 Using a recipe from a magazine, she baked my father these special cookies each Christmas; in later years, sometimes omitting crucial ingredients or adding new ones– my father swears she put small pieces of glass in a batch. She died a decade ago without giving anyone the full recipe. Through the magic of the internet, I saved myself the trouble of having to search through old magazine issues in the library and found the recipe online. It’s a simple, old-timey and straight forward recipe, and, most importantly, it makes a batch that taste just like my grandmother’s cookies. 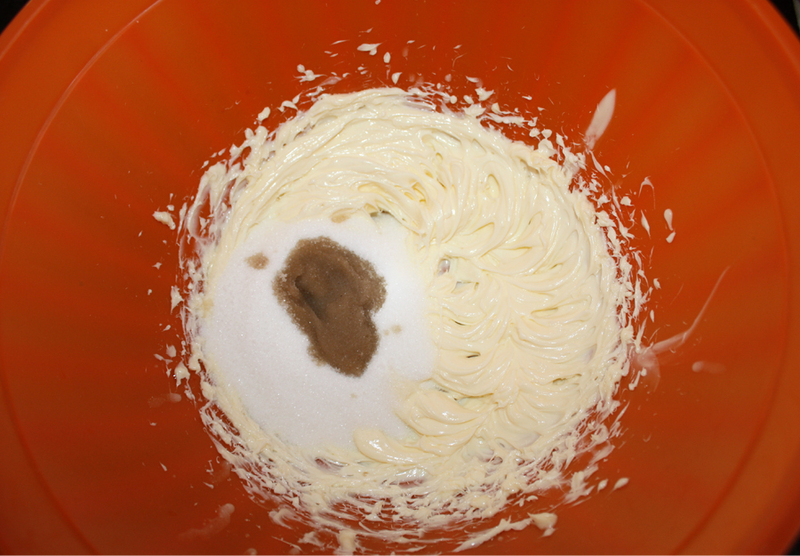 Here is the butter all whipped up and the vanilla and sugar just being added. Here I’ve fully mixed all three ingredients. 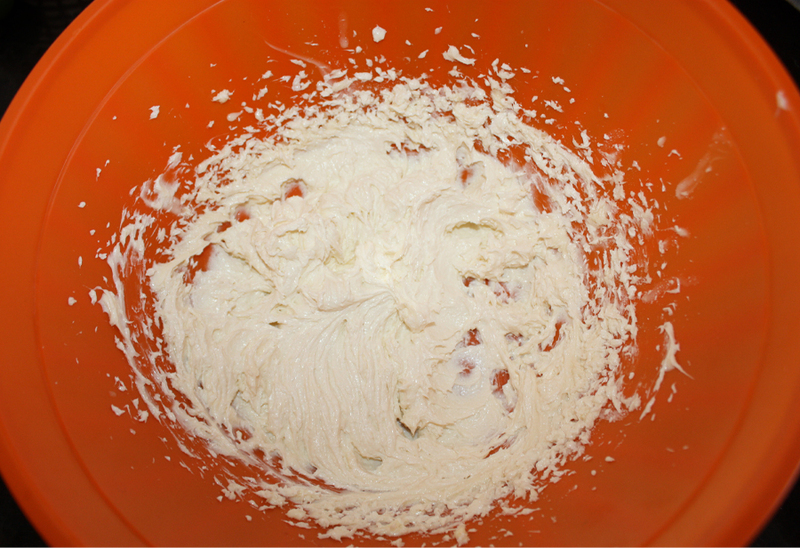 This is with the full amount of flour added. 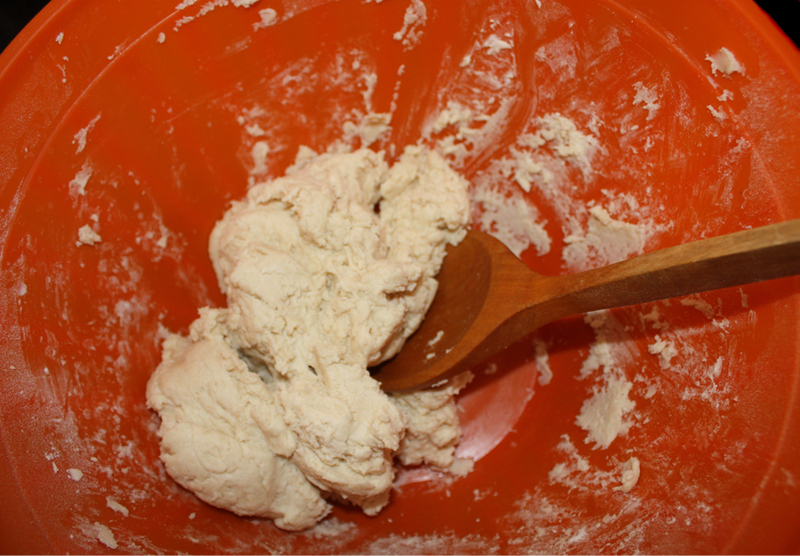 I found that I needed to stop using a mixer and switch to a spoon after about two cups. My lovely cookie lumps. My very MacGyvery process of dividing them into 1×1 inch squares shall remain shrouded in mystery. (I forgot to take a picture). 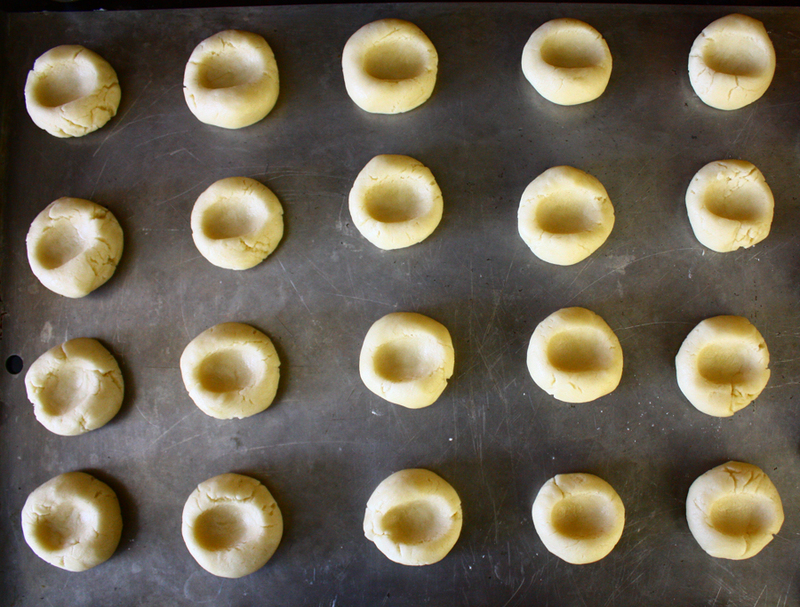 I did not roll them in coarse sugar because I was trying to replicate my grandmother’s cookies, and she never did so. Depressing the cookies with my thumbs (note that a sad story might work too). 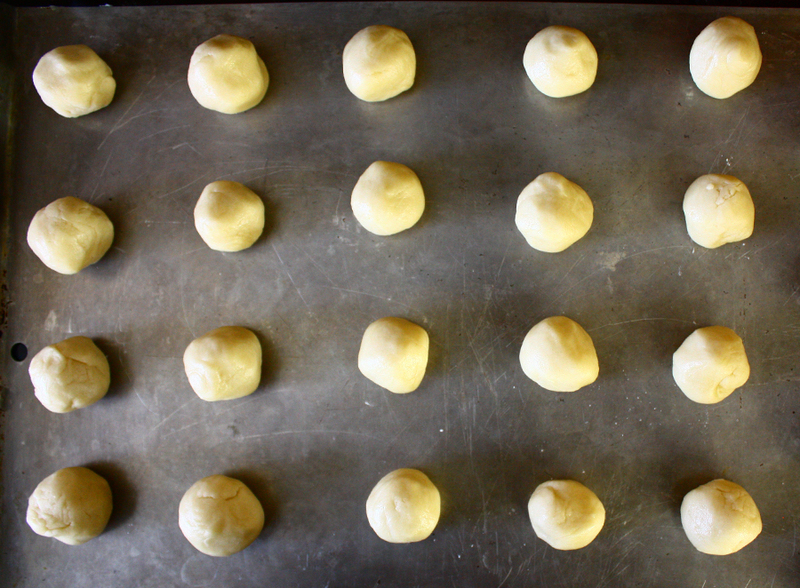 These babies are ready to go in the oven! Note that the recipe calls for them to be baked 8-10 minutes at 375 degrees F. I’m not sure if it was the stove I was using, but to achieve a very crunchy/browned cookie, I let them bake for approximately 20 minutes. To make sure you don’t burn them to death, just monitor them every two minutes or so. 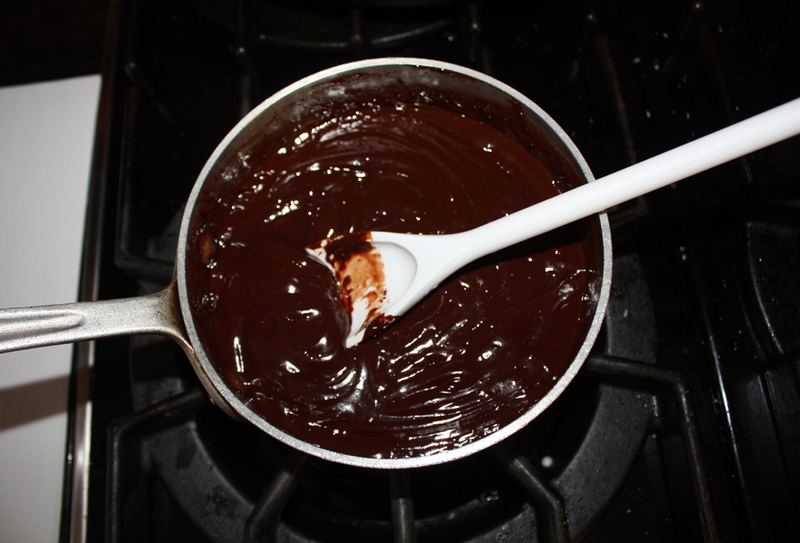 While the cookies baked, I made the chocolate ganache. Mixing two ingredients is something I’m capable of excelling at. 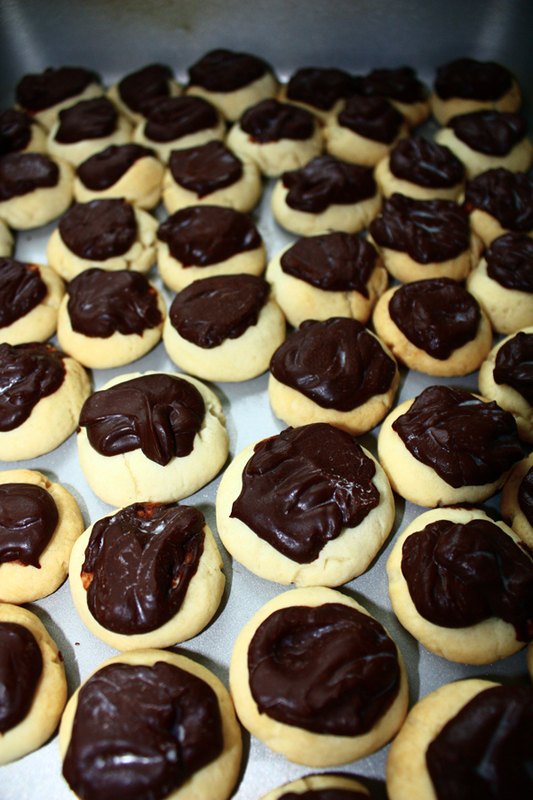 The newly chocolate-topped cookies. The recipe all but demands that you enjoy the cookies immediately, as fast as is humanly possible, lest they hatch an escape plan (or something). I find that letting them sit for a few days greatly enhances the flavor. I think they taste better once the chocolate has hardened. So there you have it. 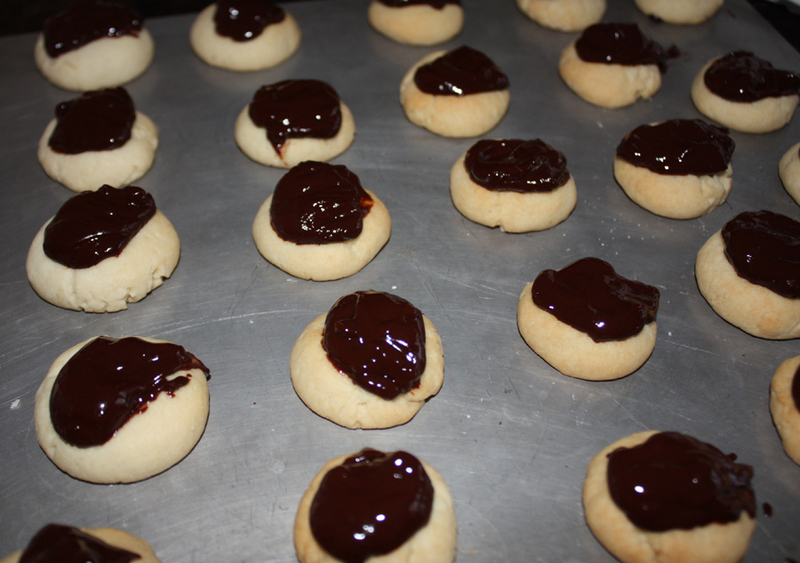 Some pretty quick and pain-free shortbread cookies! 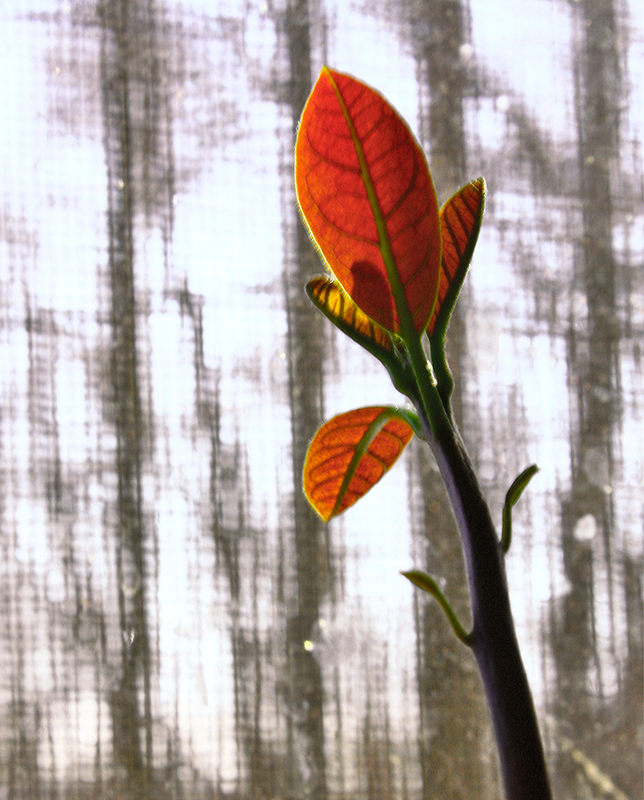 So inside my house, the plants may be flourishing. 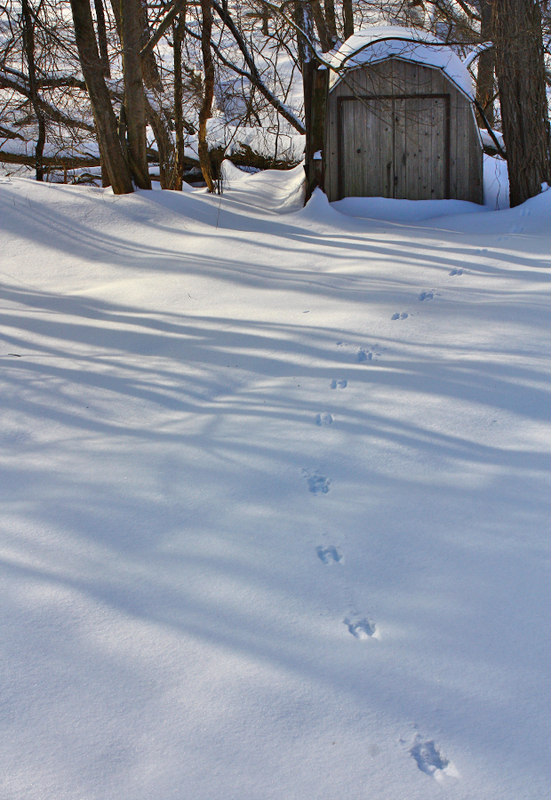 Here are some deer tracks in my backyard. 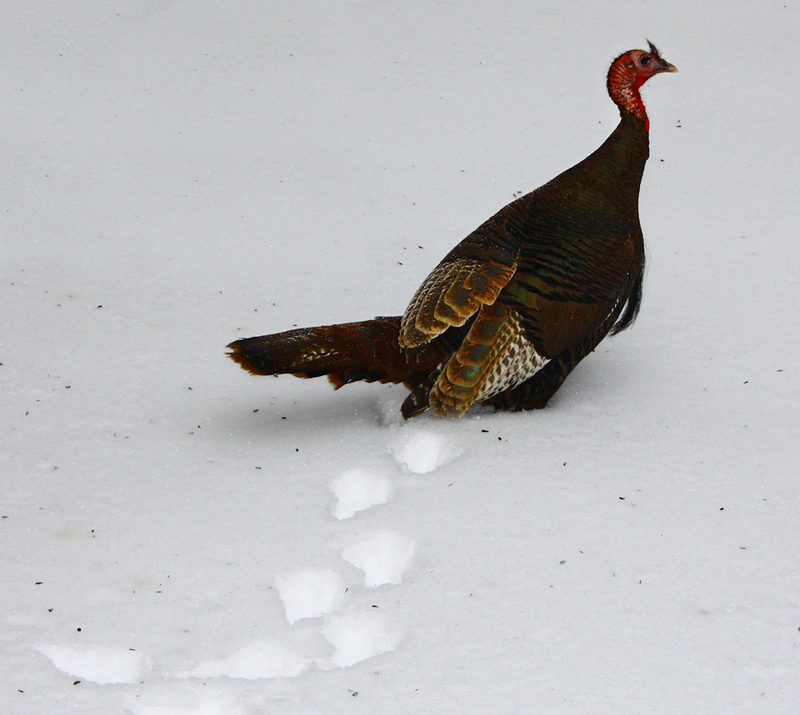 Hmm, and what kind of tracks are these? Small dinosaur maybe? …Well, almost. 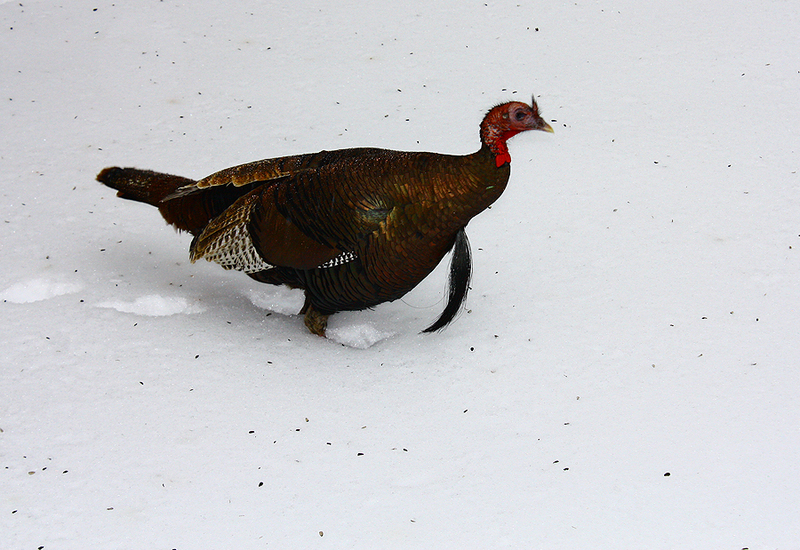 This is our idiot turkey who lurks around our house and had a brief romance with one of our cars. He’s shy and frightened of his own shadow but will chirrup when he hears a can of birdseed. Kindly ignore the horribly depressing words of the book, Into Thin Air. 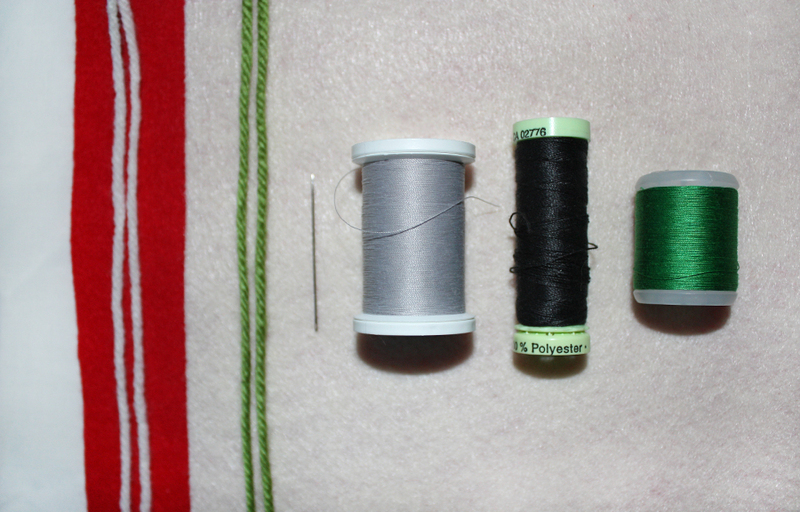 So, we’ve got off-white yarn, green yarn, red felt, off-white felt, a sewing needle, different colored sewing thread, and black thick thread. First using the white yarn, I crocheted a chain as long as I wanted/thought looked good. I then single crocheted in the second chain stitch from the hook and in every chain stitch after. I then broke off the yarn. Moving next to the green yarn, I made two identical label pieces. I chained 10, then single crocheted in the second chain from the hook and in each chain across for a total of 9 stitches. 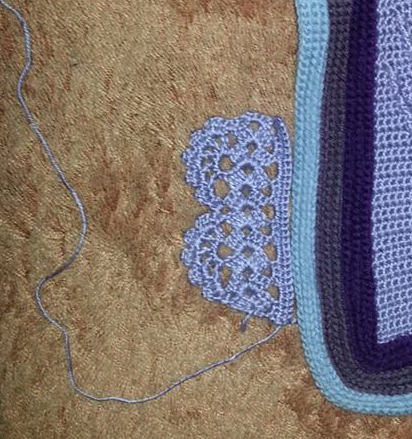 I then chained one and single crocheted into each stitch for eleven more rows to make a rectangle. On the thirteenth row, I began decreasing stitches at the ends. This means I single crocheted two stitches together to make one single crochet stitch on each end (for symmetry). 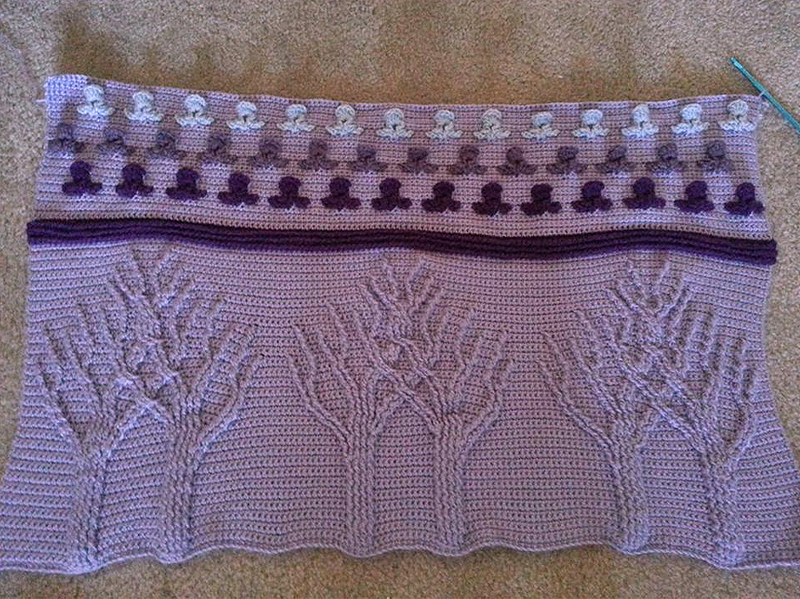 I did this for three rows until I ended up with three stitches. I then broke off the yarn. There ends the crocheting part! Everything after this involved sewing (yaaay, my favorite…). I cut out a piece of white felt and a heart on the red felt. I first sewed the heart onto the piece of white felt. 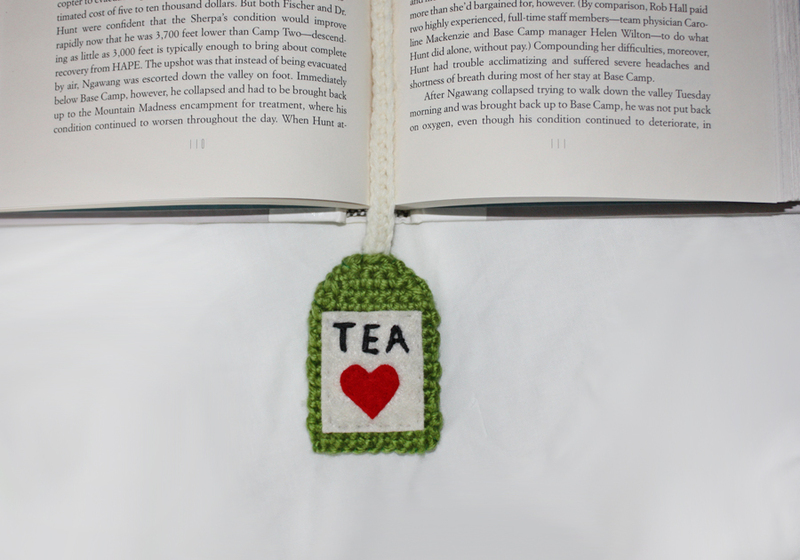 I then used the thick black thread to embroider the word “tea” onto the white felt (by far the worst/most difficult part). 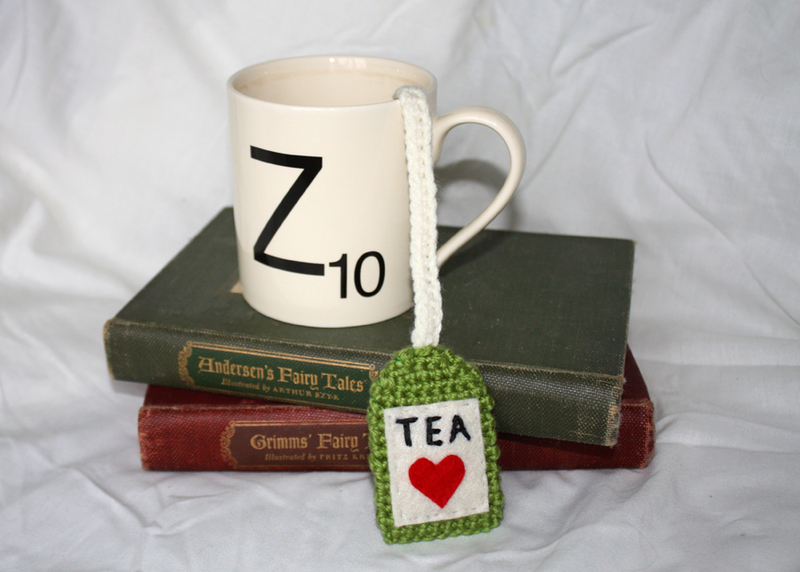 Once that was finished, I sewed the white felt onto one of the green crocheted label pieces. I then placed the long white chain between the two green label pieces and sewed them together! 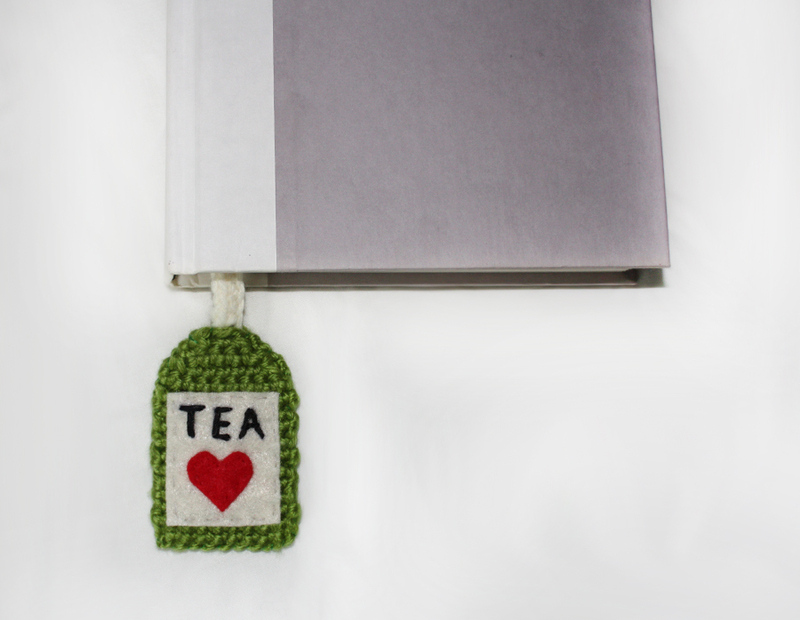 And there you have it, a cute little bookmark. Bookmark in a closed book. Public service announcement: never use books as coasters! 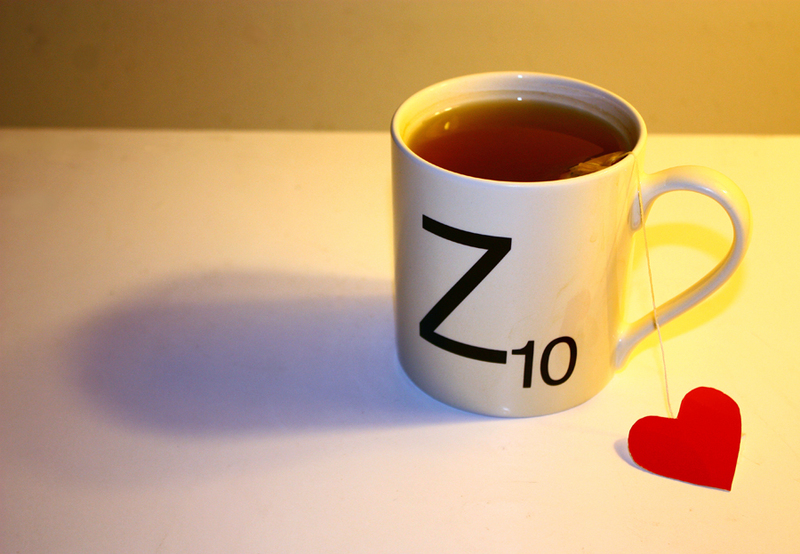 Tea, of course. I’ve been drinking a crazy amount of green tea recently. The Scrabble cup was a Christmas gift. No, there is no “Z” anywhere in my name…but if I’m picking out letters, why wouldn’t I want a letter worth the most points? I also just like Z as a letter. I’m one of those people who crosses my Zs (and my 7s). I think I picked the habit up in French class. 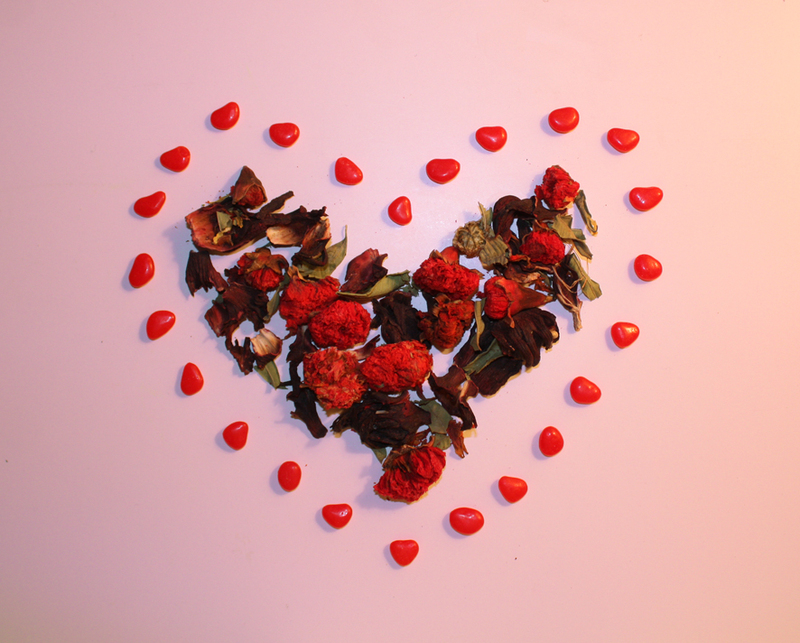 You know what goes well with tea? Sweets! My mum also surprised me with a happy little donut from Dunkin’ Donuts. Maybe my northeasterness is showing, but there is no better place for doughnuts (and yes, I’ve had Krispy Kreme). Me, standing on my current project that is (almost, kind of) near completion! 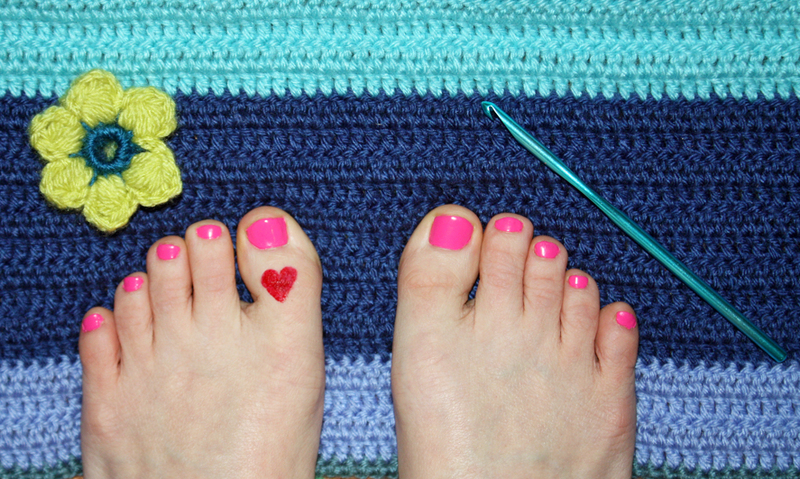 I painted a heart on my toe with nail polish because, wouldn’t you know it, of all the paint that I brought home with me, I don’t have any red! The color I’m wearing on my toe nails is Zoya’s Tobey. It can only be described as Barbie World pink. 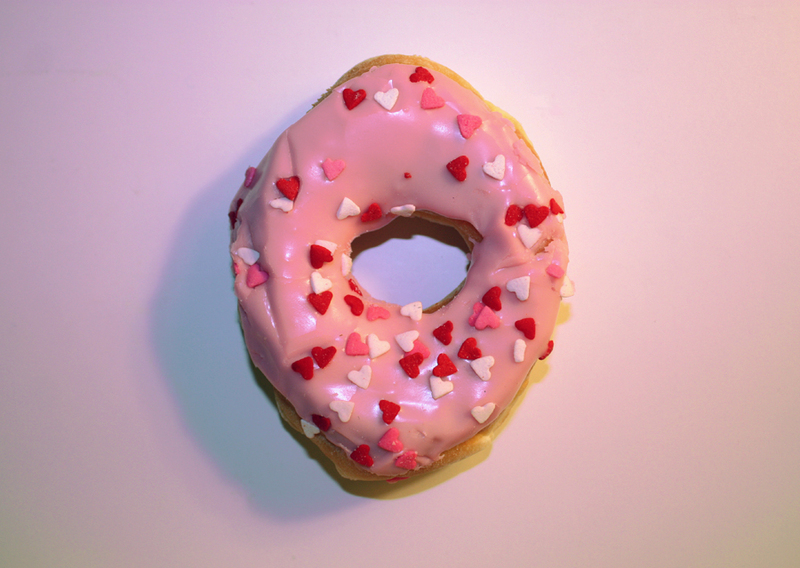 I hope everyone has a Happy Valentine’s Day! 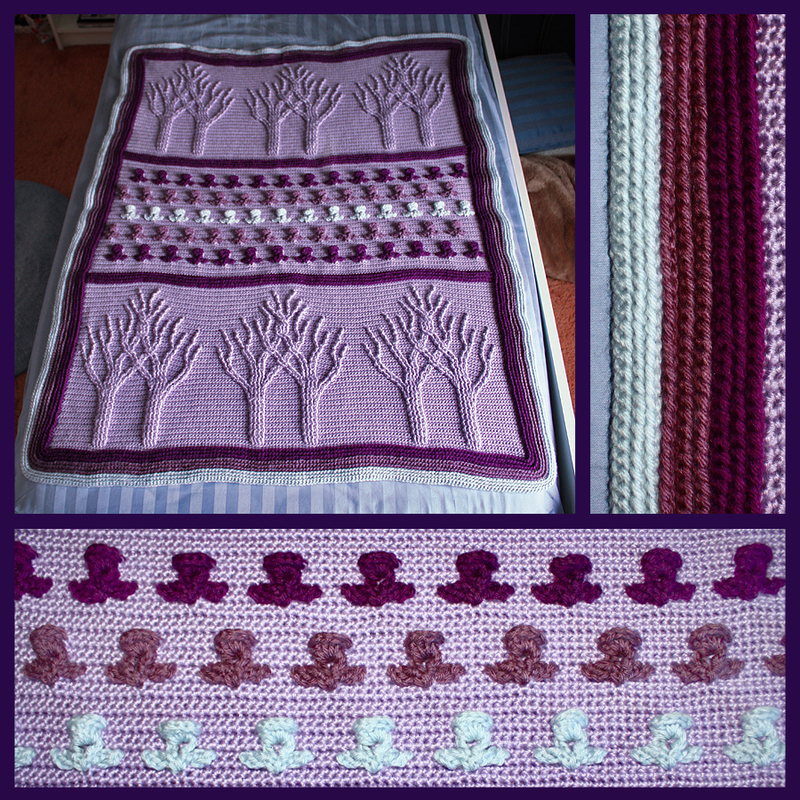 *Trumpets sound, angels sing* My second blanket is finally done! …Actually, it’s been done for maybe two months, but taking pictures of it is difficult because of the raised trees. It looks awful with flash, so you need enough natural light (read: a sunny day) to take a decent picture. But it looks beautiful in person in any kind of light, of course! ANYWAY, for those interested, I used this very free pattern on the Lion Brand website. I changed it a little bit to suit my tastes. I added more room between the thistles/flowers in the middle because I thought they were spaced too closely together. It threw off the square shape of the blanket, but I don’t really mind. I also changed the border. 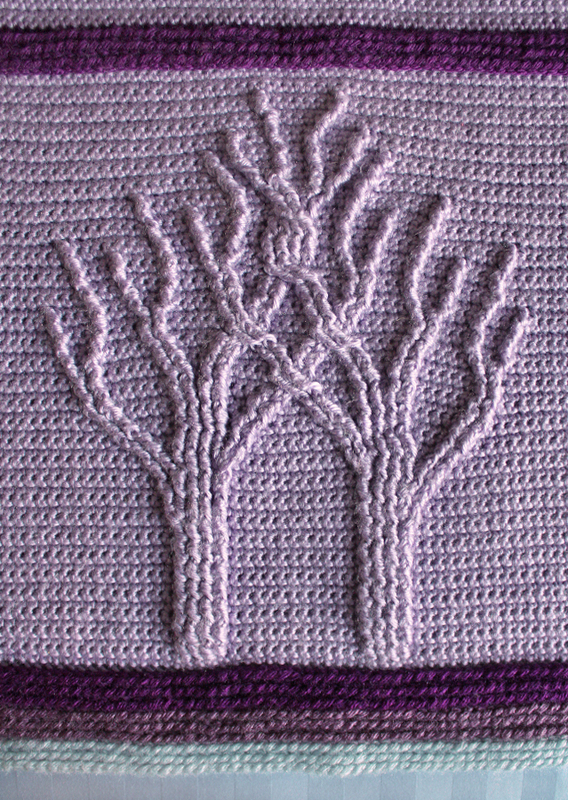 I actually really enjoyed making this blanket, especially the trees. I hadn’t learned that stitch before (the back post and front post stitch), and it was super fun! It went surprisingly fast. This is after about a month or so of working on it very sporadically (thanks a lot, law school!). This was a border I was going to add but I thought it was a bit too much. I think with the trees and the flowers/thistles and the multicolored raised border, it is fine as it is. It’s important to have an editing eye. Anyway, I’m really happy with how it turned out. It’s my second blanket overall and my first blanket that isn’t worked in the round/comprised of squares to be put together. I encourage everyone interested to try the pattern! It looks overwhelming and challenging but once you get started, it’s really not that hard (I promise)! 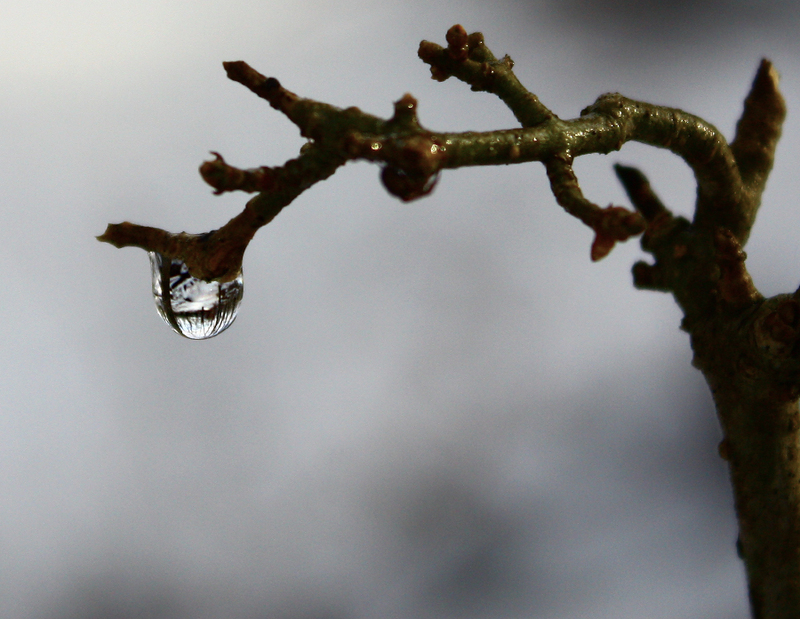 We were hit with another snowstorm, so I brought out the camera. Our male cardinals are total babies and very skittish. 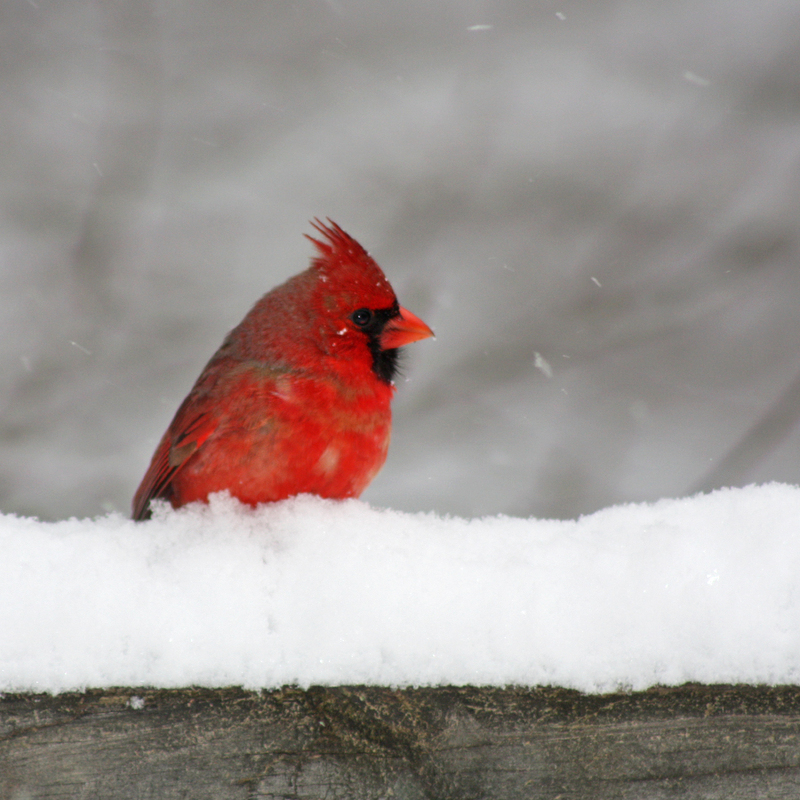 Until today I had never successfully taken a picture of a cardinal in the snow. I was determined…so I had to stand there for fifteen minutes losing feeling in my feet before one was brave enough to come near the seeds I had put out. Victory! 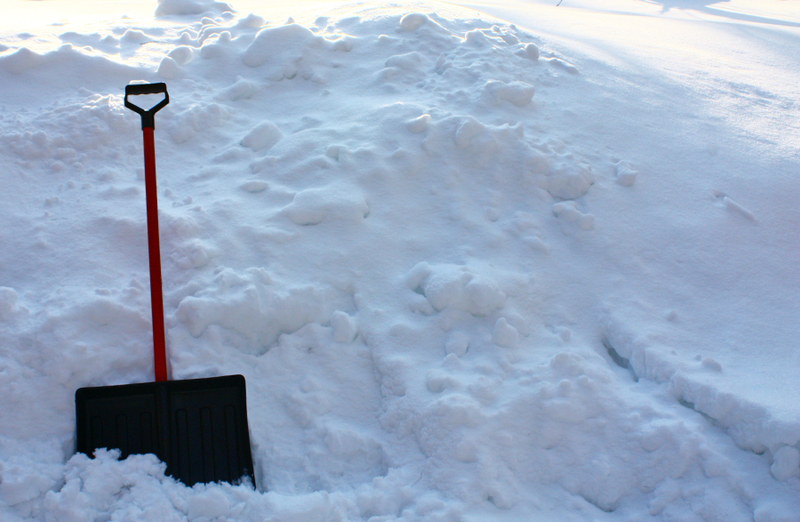 I love how the red stands in stark contrast to the white/gray tones of the snow. 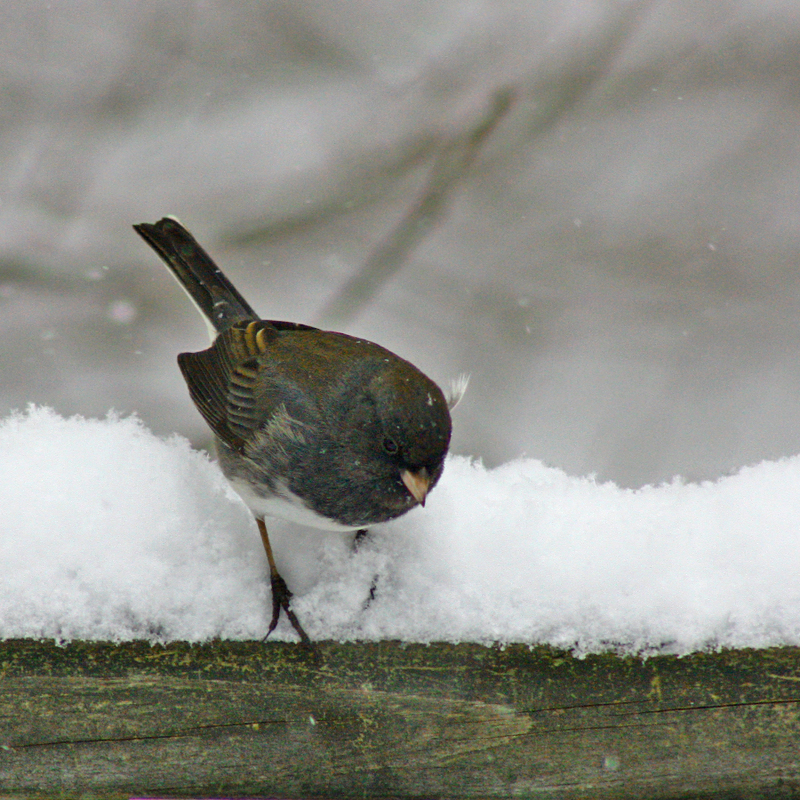 Clockwise: cardinal (m), black-eyed junco (? 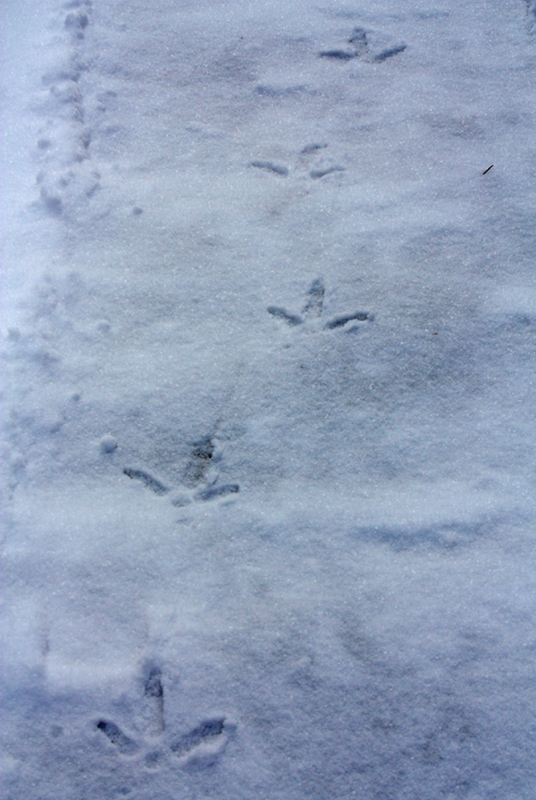 ), cardinal (f), cardinal (f), white throated sparrow (I think). 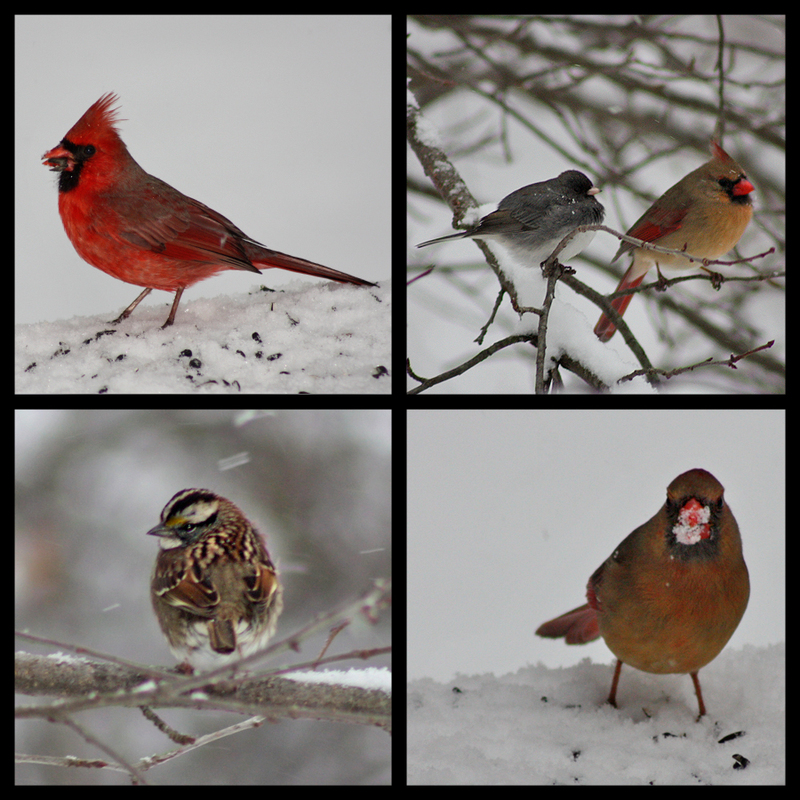 Here is a nice little sampler of the various birds who were out today. 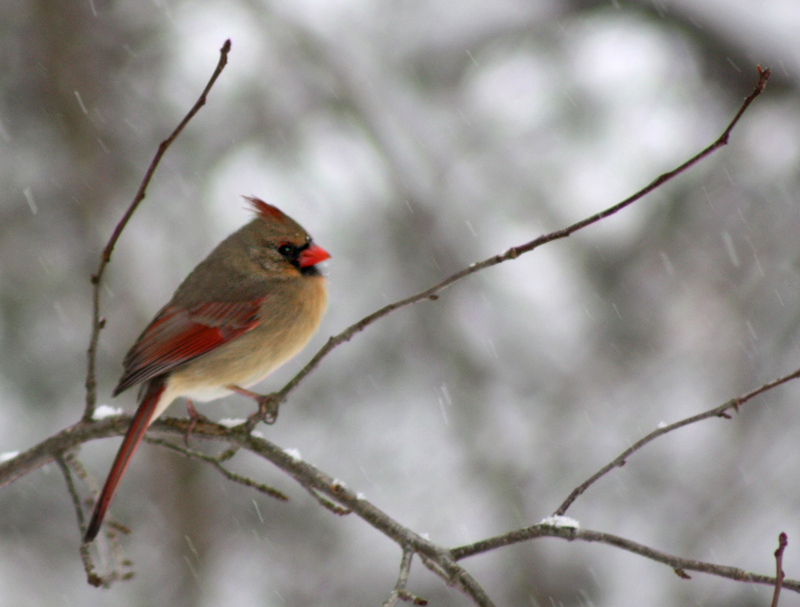 My favorite is probably the lady cardinal with snow all over her face. This squirrel was unusually skittish. Normally, I practically have to physically toss squirrels away from the bird feeder. 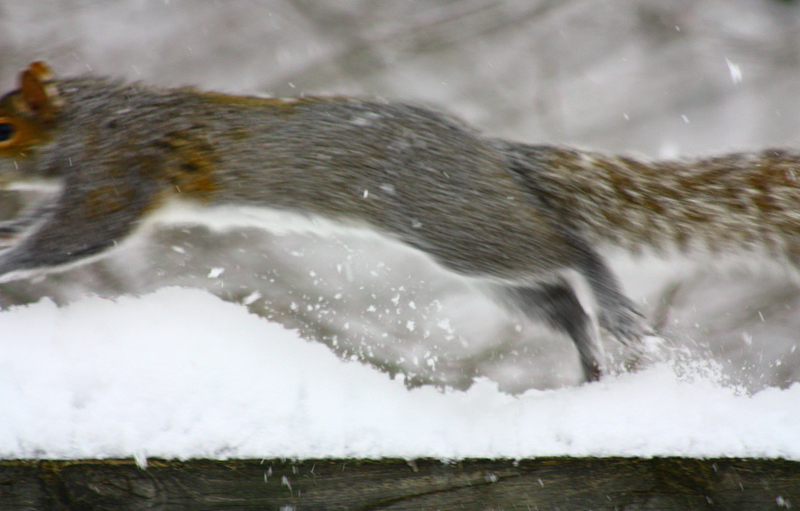 I had barely pointed my camera in his direction when he took off at full speed and launched himself right into a tree. So graceful (not).